Introduction - Why Secure Your Distribution Groups? In many companies, there will be a group equivalent to "All Users". This group should be secured, but can also provide security for other groups that you may have. Open the Exchange Management Console and find the group you wish to secure. Right click on it and choose Properties. Click on the tab "Mail Flow Settings" then select Message Delivery Restrictions and choose Properties. You can then secure the settings as with Exchange 2003 by selecting a group and requiring the sender be authenticated. 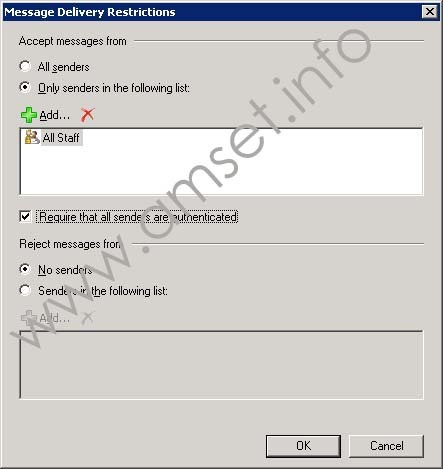 However in addition you can also set who messages are rejected from, which is different to Exchange 2003 where it was either accept list OR reject list.